Capsule Stations or ‘Gashapon’ are a big deal in Japan, located outside any place that kids or otaku (nerds) might go. 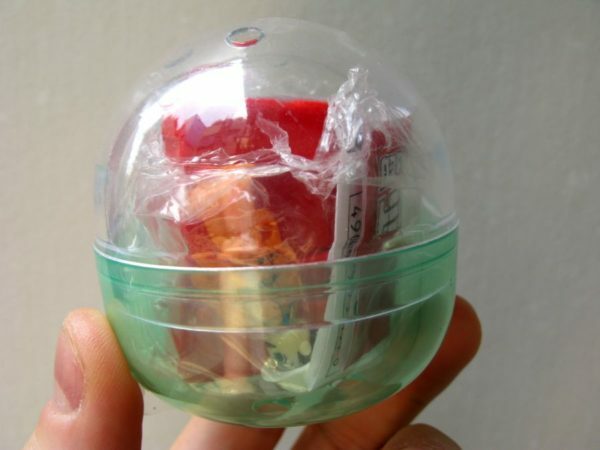 They are basically toy vending machines, like gumball machines, but for toys in plastic egg-shells. The name Gashapon is onomatopoeic, where the ‘Gasha’ is the sound of you turning the handle, and the ‘Pon!’ is the capsule toy popping out. They dispense a whole range of toys, from super-cheap garbage up to higher-end ‘adult-content’ type stuff. You can see my other Toys / Games articles in the Toys / Games gallery. If you like this post, why not link to it, or leave a comment? Thanks. Hey, your video is showing “We’re sorry, this video is no longer available”? Really? That’s weird, it doesn’t say that to me. I’ll try in another browser. Hey – I think the Japanese term for these is gatcha gatcha machines. Or gadja gadja? I’ve never seen such a huge bank of them. Didn’t notice these the last time I was at the Akiba Yodobashi. Have to look next time I’m there. I can sometimes find very good miniature crustaceans in these. Still looking for a Tarabagani – woohoo! Ah – I see you had the name at the top. Those micro-organisms are brine shrimp – the sea monkeys from comic books. Sea monkeys huh? I’m thinking about buying some, having a crack at cultivating them. Any tips? Salt water and patience. You need to feed them something too – not sure if they give you the microalgae they eat.